I got this in the mail yesterday. They got it to me pretty quickly. I was very happy to see it. Now all I have to do is find some people to train. I’ve been doing some home sessions with some friends and I think they’ve gone well. One of them has had a trainer in the past, but she says that she likes what we are doing much better. I like hearing that. One of the things that I have them doing is a mobility style warm-up. I have really seen the value in this and I give full thanks to Eric Cressey for it. To me it’s really a part of the workout, just as important as any one exercise. I think this is especially true for people who don’t have a whole lot of workout experience. Actually, when I think about it, calling it a warm-up is probably not the best way to refer to it. That gives it a bit of an optional kind of tone. I should just call it a mobility circuit. I like that. I have been putting an extra emphasis on X-band walks and either bird-dogs or supine hip-extensions with them. I think it’s really important to wake up those glutes. It really seems to me that the glutes are the most neglected muscle in the body. I might be wrong, but I know, in relation to these two things, that since I have concentrated on glute function and have been doing this style of warm-up myself, I have felt great and seem to be moving around much better. So anyway, there you go. A rambling, poorly gramaticized (is that a word?) post. I hope you’ve enjoyed it. Talk to you soon. P.S. Don’t forget to take the latest poll! P.P.S. My new business cards should be here by the end of the week. 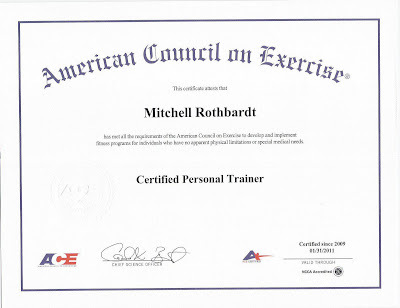 If you’d like one, email me at mitchrothbardttraining@yahoo.com or write your address in the comments section. I’ll get you one out right away.